in the ancient manner with the eagle crest." 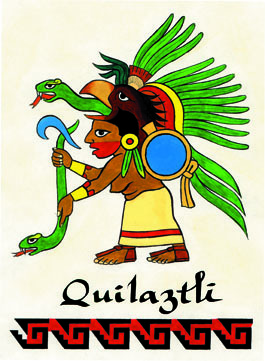 Quilaztli was also known as a creation goddess. She ground up the bones that Quetzalcoatl brought up from Mictlán, the world of the dead, and put them in a clay jar in the creation of humans of the Fifth Sun. Aztecs praised her as the Mother of Humankind. They also called her Cihuacoatl, Serpent Woman. with her hands full of good things. She also carries a broom. you can appreciate what power I wield and what harm I can do you, and if you want to test the truth of this, here is my challenge!" and the capital city of Tenochtitlán.